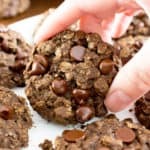 Dark Chocolate Chili Nut Clusters Recipe – this homemade chocolate nut clusters recipe is healthy, easy and decadent! It’s the perfect dark chocolate treat – spicy, rich, packed with sweet nut clusters & prep’d in 15 minutes! 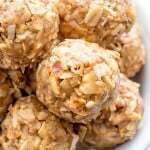 Just 4 ingredient, Paleo, Vegan, Gluten-Free, Dairy-Free, Refined Sugar-Free. Only 74 calories and 7 carbs per serving + 2 grams of protein! Did I ever tell you about the time I made homemade chocolate candies for my whole class in high school and chickened out when I realized I actually had to hand them out? You see, I have this familiar set of anxieties when it comes to presenting people with food I’ve made. I know, I know, I should be expert-level when it comes to this kind of thing (by now at least). But the thing is, this blog is online. Like, I’m not just knocking on rando people’s doors and presenting them with a gorgeously decorated plate full of homemade crunch bars, oatmeal chocolate chip cookies and sweet ‘n salty nut clusters! But anywho, way back during Valentine’s Day 2000 or so (quit calculating my age!! Right this moment!! Hehe), I decided to come out of my shell and make ‘n pack homemade chocolate goodies to bring to school. Thing is, I didn’t know that not only is making these treats kinda messy, but so is wrapping the buggers and transporting them all the way to school. Let’s just say, I was a sweaty and chocolatey mess by the time I got to passing them out the third period of the day. I only ended up passing out like 3 of the 16 treat bags that my sister Monica helped me make. 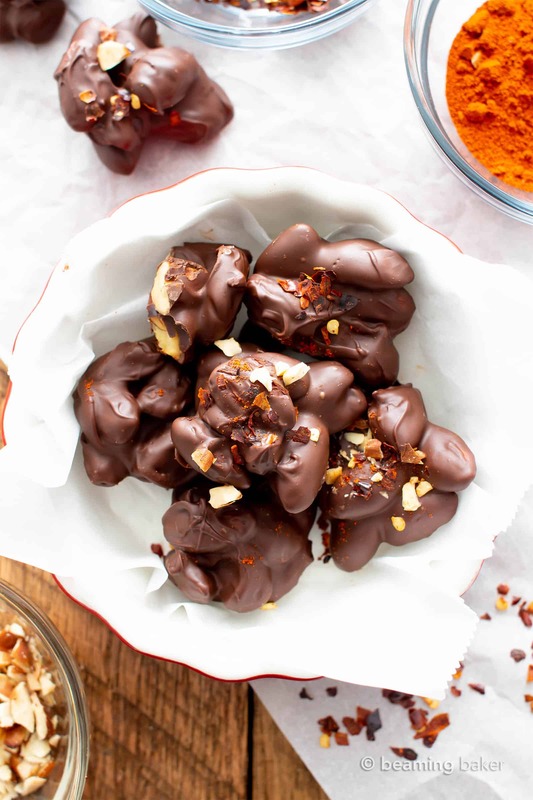 Now that I’m safely seated at home, where my introvert tendencies need not be challenged on a daily basis, I can not-awkwardly (okay, a little awkwardly since it’s kinda my signature at this point) share this delightful Dark Chocolate Chili Nut Clusters Recipe with you. 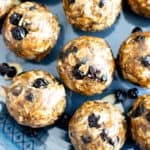 They’re awesomely healthy, homemade and vegan! And no, I would totally not have the soft baked vegan donut balls to say & sell these to you while waiting on your doorstep, awkwardly grinning like a fool. 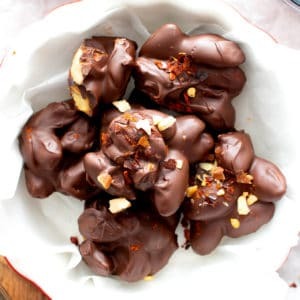 😉 Without further ado, let’s chat about all things Homemade Chocolate Nut Clusters! Read below for common questions, substitution notes, related recipes, tips and more! 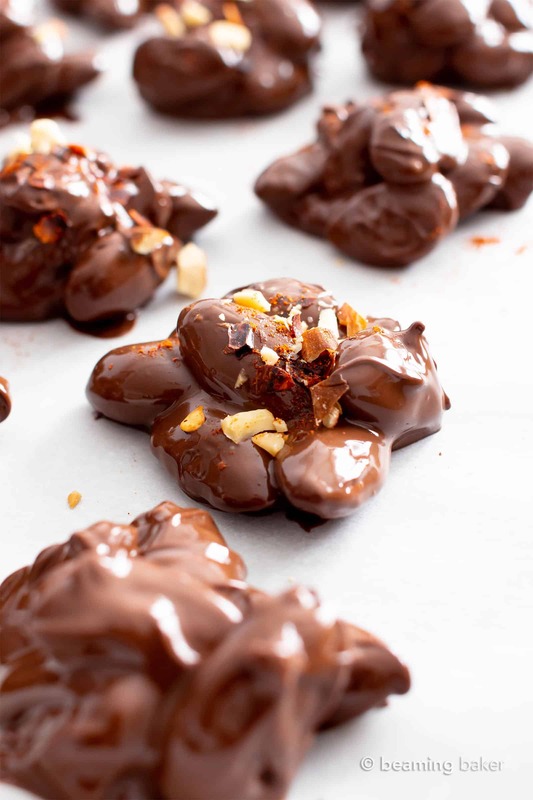 How Spicy are these Homemade Dark Chocolate Chili Nut Clusters? In one word: spicy!! But not to fear, you can entirely remove one of the spices (the hottest one, imo), if you’d like! Psst… it’s cayenne! 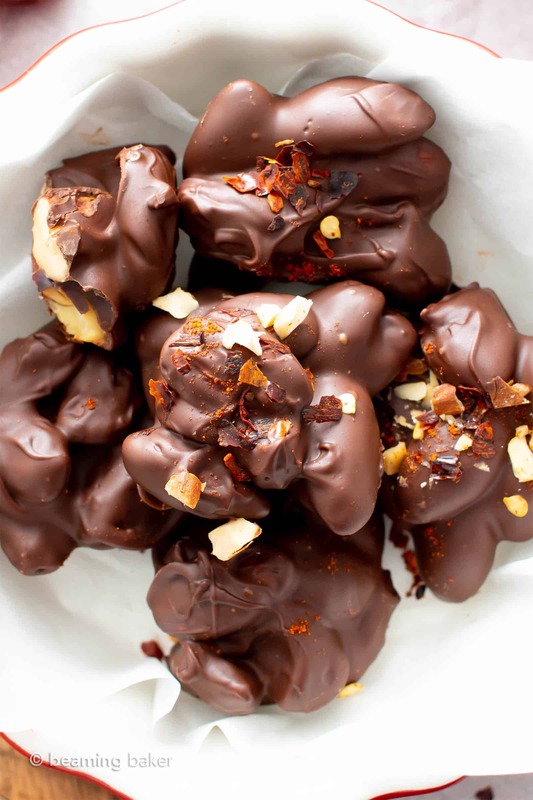 Are these Easy Homemade Chocolate Nut Clusters Vegan, Gluten-Free, Dairy-Free and Paleo? 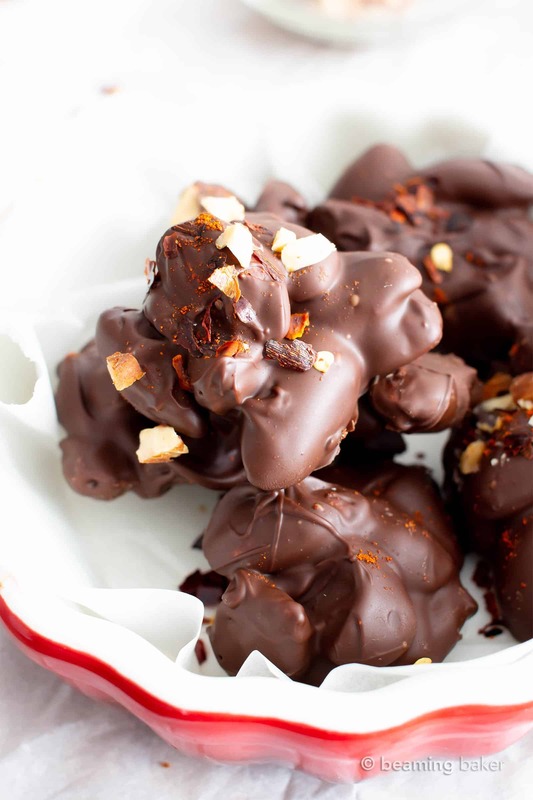 Tools to Make this the Best Homemade Chocolate Nut Clusters Recipe Ever! 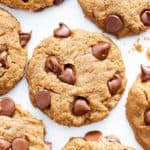 Vegan Chocolate Chips – a great vegan chocolate chip alternative that’s Top 8 Free. Paleo Vegan Chocolate – one of my very favorite chocolate brands ever – it just happens to be paleo, vegan & dairy-free (and gf!!). Double Boiler – use this instead of the microwave to melt your chocolate! Coconut Oil – great quality coconut oil at such an awesome price! Unbleached Parchment Paper – my favorite unbleached parchment paper to use for baking & making homemade candy. 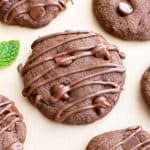 Dark Chocolate Chili Nut Clusters Recipe (V, GF): this homemade chocolate nut clusters recipe is healthy, easy and decadent! It’s the perfect dark chocolate treat – spicy, rich, packed with sweet nut clusters & prep’d in 15 minutes! Line a small or medium baking sheet with wax paper or parchment paper. Set aside. To melt the chocolate: use the double boiler method or do the following. Add chocolate and coconut oil to a medium, microwave-safe bowl. Heat in 20-second increments until melted. Stir in between heating increments, until smooth. Fold in nuts and spices. Using a spoon, scoop and drop piles of chocolate-covered nuts on the prepared baking sheet. These cluster piles should be evenly spaced apart. Optionally, sprinkle with finely chopped nuts and spices. Allow to set at room temperature, until firm. Or, chill in the refrigerator, for about 30 minutes. Enjoy! Storing instructions below. Adapted from my Salted Dark Chocolate Almond Clusters. 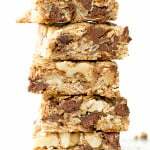 Also try my 3 Ingredient Chocolate Almond Bark and my Dark Chocolate Almond & Coconut KIND Bars. - Nutrition Information: is an estimate based on the best-selling, most common brands per ingredient. Also, it's estimated based on 24 servings per recipe. ???? 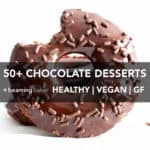 Previous Post: « Soft Baked Chocolate Vegan Donuts Recipe (Gluten Free) – w/ Vegan Chocolate Ganache Glaze! LOL what a great story! I’m an introvert too, and actually hate bringing food to any type of event. i feel like everyone expect me to bring this awesome dish since i cook, and the pressure is too much!! anyways, these look perfect, love the chili flecks on them. Haha oh yes, I know exactly what you’re talking about Danielle! ???? ???? You know it Natalie! ???? So easy and fun! This is such an awesome flavor combo! My family is already requesting that I make these again! Woohoo! So happy to hear they enjoyed it! ???? They are seriously so good! ???? Hope you enjoy them Noelle! 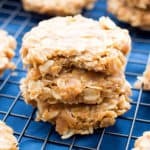 This is definitely my kind of treat — not overly sweet with a nice crunch and a little heat. This is the kind of chocolate I want for V-Day. By the way — I wish I’d been in your class — cause I definitely would have wanted one. Aww you’re too sweet Lisa! ???? And yes, the sweet + the heat is the perfect flavor combo! ???? Same here! ???? Thanks Dee! I love the idea of spice with chocolate…I can’t wait to try these. It’s seriously soo good! ???? I know you’ll love it Sandi! YUM! Love this idea! Perfect mix of sweet & spicy! Oh yes! My thoughts exactly Taylor! ???? 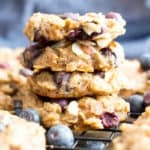 These nut clusters look amazing! I love the addition of chili! Woohoo! I am so happy to hear it Ana! ???? Haha oh I’ll bet! ???? 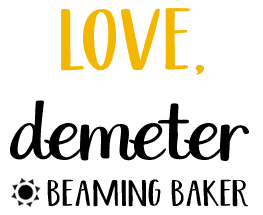 Happy Valentine’s Day, Demeter! Didn’t recognize you as a fellow introvert since you put yourself out there in your blog, but online interaction is of course different than real life. And I know there are some great writers who are extroverts, but I think that perhaps introverts hone their writing skills more than extroverts, who are better vocally. These were fantastic! So easy to make and just the perfect amount of spiciness. 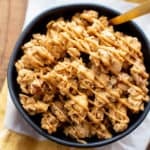 Loved the variety of nuts—-I would have thought just to use almonds, but a medley made it even more interesting. inheritance, and after making a below average salary in human services) to ever buy them. But now I can have all the nut clusters I want and know they are made with great ingredients. My husband and I had some pre-valentine’s Day watching Bohemian Rhapsody—doesn’t get much better than that for us! Happy Valentine’s Day, Ellen! 🙂 Yes–online interaction is SO different from… out there! Hehe. (Felt a little X-Files-y saying that.) I think I might be too much of a perfectionist/overthinker/hard-on-myself-to-the-point-it’s-maddening that sometimes social interactions are hard. I can’t do everything “right”, so it can be tough–especially since my upbringing was a bit unforgiving. So I’m learning to put myself out there and accept imperfections because they’re beautiful. Yep, I stored mine for a month! I’m a bit over-the-top in testing recipes as well as storage instructions. Hugs!! Hi Anita, thank you so much!! That truly means a lot to me. Big hugs! This should be on my must-make list!! Looks delish! Yes it should! 😂 It’s seriously so good!